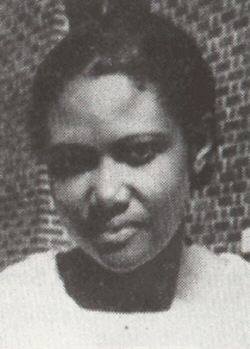 Roger Arliner Young was the first African-American woman to receive a doctorate in zoology. This is especially noteworthy because she earned the degree in 1940, which was a difficult time for women and for African-Americans, and she lacked most of the economic and social support systems that most scientists rely on. Dr. Young was born in 1889. She was 32 years old when she took her first science course, and she got a C. But her teacher, Ernest Everett Just, an African-American biologist, encouraged her to pursue science and became her mentor for many years, until they had a bitter falling out in 1935. Her family struggled with poverty and during her adult life Dr. Young cared for her disabled mother. Dr. Young struggled with logistical issues and serious mental health issues throughout her career. Despite the challenges of gender, race, economic hardship, and family obligations, she contributed greatly to her field. Young was best known for her teaching career and for her research, which involved the effects of radiation on marine life, the way paramecium are able to manage salt intake, and the hydration and dehydration of cells. She was the first female zoologist to publish in the journal Science. We like stories with a steady arc – person is born with some sort of disadvantage, they have a dream, they pursue it, they succeed. Young’s life was not that kind of story. She had ups and downs. She gave up her academic studies for a while she lost jobs and got jobs, she struggled with her mental health, and she does not ever seem to have had a happy personal life. But she held on to science against every obstacle and made significant contributions in her field. She put herself through school and was the sole support of herself and her mother, and she struggled with finances and mental health issues until the day of her death at the age of 75. I find her story to be, in a way, more inspirational than many with happier endings. When it came to science, you just could not keep Roger Arliner Young down. Hodges, Fran. “Young, Roger Arliner 1899–1964.” Contemporary Black Biography. 2001. Encyclopedia.com. 1 Jan. 2014<http://www.encyclopedia.com>. I also used this source, which provides hours of reading about women in science: Women in Science, from the San Diego Supercomputer Center. This entry was posted in History's Hidden Heroes and tagged African American scientists, Ernest Everett Just, female scientists, Roger Arliner Young, Women in science, women in zoology.